How can i integrate sublime text? I prefer this better than note. Solved Errors post install. Is this normal? Having issues getting Laragon working. Is this normal? I just installed laragon and i am searching for some documentation or something to read about it. I know it works out of the box and loved it but curious. And i have some questions if you please. -I already installed PHP, Mysql, Conemu on my computer but my setting are different then what comes with Laragon. 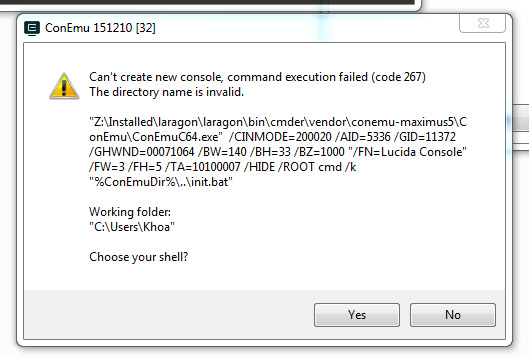 I assume Laragon installs them again separately from my system. Am i right? -I see mysql as database running but when i write "mysql" in conemu instance, it opens mariaDB connection. What is that? For the Laragon, i can say. KUDOS. How can i setup laragon project to make it accesible from remote pc trhow internet. I get the following when trying npm install - any ideas? gyp ERR! command "C:\laragon\bin\nodejs\node.exe" "C:\laragon\bin\nodejs\node_modules\npm\node_modules\node-gyp\bin\node-gyp.js" "rebuild"
Solved Can you bump npm to npm 3? Using npm 3 works. Can you add npm 3 per default for the next release? Why laragon don't run automatically when windows 10 start?? The options for this is checked, but not work. What can be the cause? why my node version in my cmder include with laragon and in cmd is different? can anybody explain it? prevously my node version is v4.2.3 but i installed version v5.4.0. but in two cmd has different version. Solved Move project to another PC. How to easy move project from laragon to another PC? I just make CTRL+C & CTRL+V a root project, but i get alot of error. What else have to do? When I try to use from the terminal I receive the error "Could not open input file: artisan". How i can open the MYSQL console on the cmd? (I want the mysql original console. Not MariaDB because i want to learn mysql from the beginning). And congratulations for this forum. But... can you put the help in the official site?